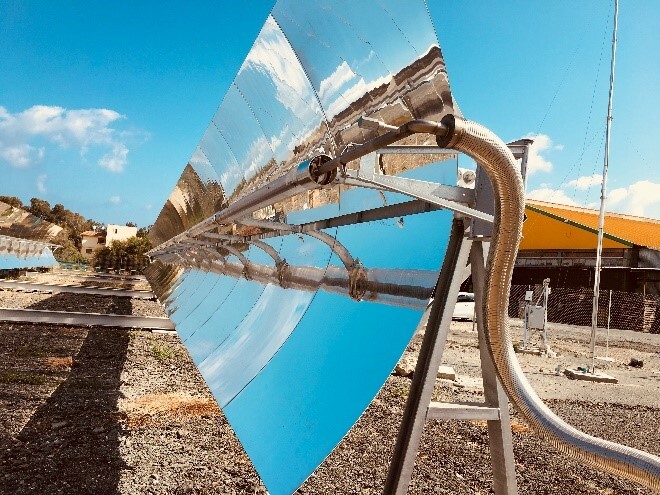 As part of a transnational research project Protarget AG and its partners have developed and built a solar steam boiler system for “Kean Soft Drinks Ltd.“ in Limassol, Cyprus. The objective of this project is to carry out industrial research that demonstrates and verifies the dispatchability and performance of a high temperature solar thermal system designed for continuous (24/7) operation. The project is called EDITOR which stands for “Evaluation of the Dispatchability of a Parabolic Trough Collector System with Concrete Storage”. The system design consists of a mid-sized parabolic trough collector loop combined with a concrete thermal energy storage which has been specifically designed for industrial applications requiring heating or cooling for up to 24 hours. With Kean Juicy in Limassol, as the consumer of the solar steam, the ideal partner was found. Not only because of Cyprus excellent solar conditions, but also due to the fact that Kean Juices is focusing on innovative and sustainable production methods. 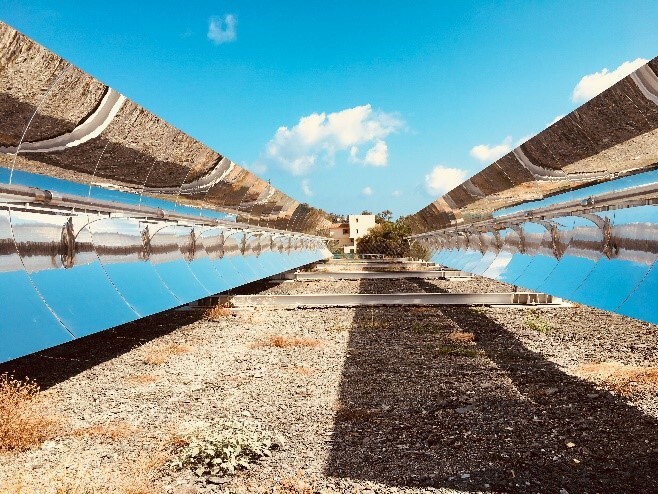 The current market for solar collectors designed for process heat applications is dominated by systems with maximum operating temperatures of around 250 °C. Whilst these collectors are able to generate process steam effectively, few of these have been equipped with any form of storage. 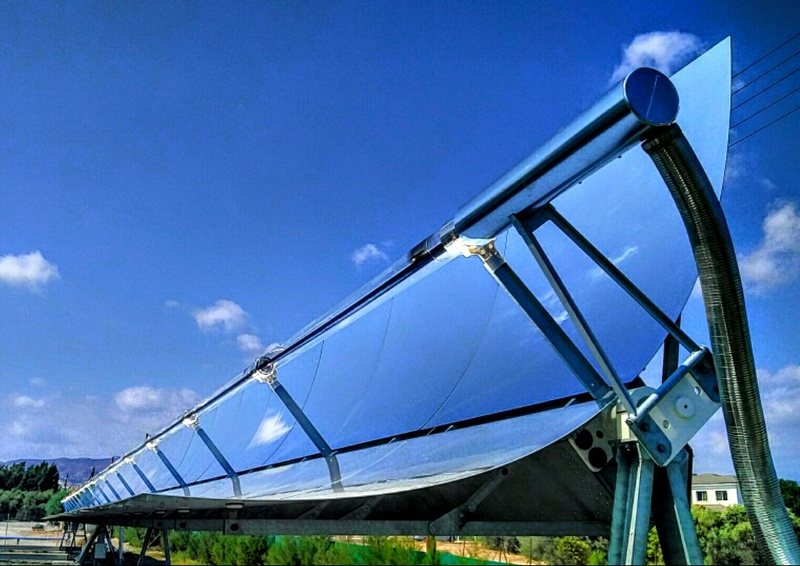 Larger solar collectors designed for supplying energy to electrical generation plants have been equipped with complex molten salt storage systems and can operate at higher temperatures, but to do so often use thermal oils as heat transfer media that are classified as toxic and harmful. In EDITOR project and for the first time in the history of parabolic trough collector development, the deployed thermal oil will be operated at a temperature beyond 400 °C. This is made possible through the use of a new environmentally friendly silicone based thermal oil, which allows the operating temperature to be raised to 425 °C. A further innovation is the use of a newly developed evacuated heat collecting element (i.e. receiver tube). The heat collecting element was specially designed for the mid-sized parabolic trough collector aperture with the aim to increase the collector efficiency. In order to be able to produce energy on demand, an innovative new concrete storage system will be used and tested. The three year project not only involves the technical activities of building, commissioning and running the solar power system. In addition, it also covers commercial considerations such as the feasibility of scale-up, the identification of future customers and communication regarding this important development with the potential market. The international project EDITOR is funded by the Research Promotion Foundation (RPF) from Cyprus, the Ministry of Economy and Competitiveness (MINECO) from Spain, the Federal Ministry for Economic Affairs and Energy (BMWi) from Germany as well as the Ministry of Innovation, Science and Research of the German State of North Rhine-Westphalia from Germany. SOLAR-ERA.NET, a European network that brings together funding organisations, is supported by the European Commission within the EU Framework Programme for Research and Innovation HORIZON 2020 (Cofund ERA-NET Action, N° 691664 and N°786483).